We have made it clear that we are glad to have the British as our allies in the war against the transnational insurgency in which we find ourselves. Furthermore, the Brits are able to field enlisted men who are as brave as any warrior on the planet. But fawning – and false – news coverage of British operations doesn’t help to gain an accurate picture of counterinsurgency operations in Afghanistan. Reader and commenter Dawg observes that the British media has ascribed the victory in Garmsir to the British. The Captain’s Journal found this source a day or so before Dawg, and sent a rebuke to the editorial staff of the Independent, stating that given the copious data showing that the U.S. Marines retook Garmser from the Taliban, their article was the worst example of journalistic dishonesty we had ever witnessed. However, that doesn’t mean that the British are not seeing significant combat in Southern Afghanistan. They are, but we have a question as to use of forces and overall strategy. British commanders estimate that more than 200 Taliban were killed as they tried to prevent the convoy of 100 vehicles from getting the machinery to Kajaki hydroelectric dam where it will provide a significant increase in energy for up to two million Afghans. The operation has been described as the biggest of its kind since the Second World War. For the last five days the force has fought through the heart of Taliban territory to push through the 220 tonne turbine and other equipment that included a 90 tonne crane to lift it into place. With a third turbine fixed at Kajaki it will mean that the extra electricity could double the irrigation output allowing farmers to plant two crops of wheat a year. With a dramatic rise in world wheat prices this could crucially mean that it becomes more profitable than producing opium which would deprive the Taliban of a major source of revenue. Escorted by attack helicopters, armoured vehicles and men of the Parachute Regiment, the trucks trundled into Kajaki. For the first 50 miles of its journey from the southern city of Kandahar the convoy was protected by American and Canadian troops. But for the second 50 mile leg through Taliban strongholds more than 3,000 British troops were needed to fight off the insurgents. Lt Col Dave Wilson, of 23 Engineer Regiment, said the operation was the most significant “route clearance” operation since the Second World War with the sappers freeing the route of mines and improvised bombs. While medics had prepared for casualties, commanders said there was only one wounded among the British, American, Canadian and Australian troops who took part in the operation – a British soldier was crushed when a trailer collapsed on him. “As a template for the rest of this country, it’s shown that when we want to, at a time and a place of our choosing, we can overmatch the Taliban, no question,” said Lt Col James Learmont of 7 Para Royal Horse Artillery. 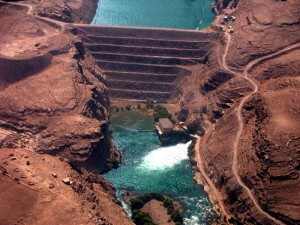 The Kajaki dam has been the object of intense combat. But even this combat intensive effort to get the necessary electrical infrastructure to the dam won’t prevent it from being the object of more combat. If anything, it will probably encourage kinetic operations and an insecure environment, just as it did in Iraq when al Qaeda targeted electricity and water supplies. Observing that “when we want to, at a time and a place of our choosing, we can overmatch the Taliban, no question,” completely misses the point. Spot encounters don’t win a counterinsurgency. The point is that in order for infrastructure to work, the enemies of that infrastructure must be targeted. The dam won’t long operate if its operators are all killed, or if other replacement parts have to undergo such intensive operations in order to be deployed at the plant. Infrastructure is good, as is good governance. But for these softer tactics in counterinsurgency to be successful, the Taliban must be engaged and killed. The softer side of counterinsurgency might win a lasting peace, but cannot win kinetic operations. Not too many months ago, one of al Qaeda’s tactics to create chaos in Iraq was to attack the infrastructure (e.g., water supplies and the electricity grid). With the retreat of al Qaeda from Anbar and the constant combat they sustain in the North, there are fewer oppotunities for them to attack the grid, and power is being consumed at higher rates in the large urban areas, while outlier cities are starved. Residents in the battered city receive just a couple of hours of mains power a day, and in the depths of winter US soldiers are facing a whole new array of challenges, said Captain Dan Gaskell. Violence in Ramadi, provincial capital of Anbar Province about 100 kilometers west of Baghdad, has fallen significantly over the past year after local tribal leaders turned against Al-Qaeda and formed a tribal front to pursue the militants. Attacks have dropped from 25-30 every day to less than one a week, and the numbers of roadside bombs have declined by 90 percent, according to US military figures. “We are dealing with a new dynamic now,” said Gaskell, company commander at the Ma’Laab Joint Security Station (JSS) in West Ramadi, one of about 30 such bases now operating in the city. But Ramadi’s 400,000 residents, almost exclusively Sunnite, are getting far less electricity than they were in the summer. “Mains electricity is between one and three hours a day,” said Gaskell, explaining that Ramadi has suffered as Baghdad’s needs have increased. Six months ago Ramadi got eight to 15 hours of electricity a day, but improvements in Baghdad’s infrastructure mean the capital is now drawing far more power. Plans are being drawn up for a new power line to be built from Fallouja directly to the Ramadi area. Kerosene, used for portable heaters, has also been a major concern this winter, with corruption and theft undermining supply. Nothing could be worse for the perception of fairness and stability than official overuse of resources by one segment of the population. Civil strife and unrest will eventually result from this inequity. Institutionalized corruption cannot be rooted out overnight, but the planning for electrical generation, transmission and distribution assets should have been in the works more than two years ago. Transmission of power from the Haditha dam to Baghdad and then back again to Falujah and then to Ramadi is a huge loss of voltage and ridiculous transmission plan. The Army Corps of Engineers should be all over this. State stabilization hangs in the balance, and this shows yet again that counterinsurgency is not just about kinetic operations. It should be mentioned that there is not only a disparity between what we should do and have done (if we plan ahead, have the right NGO involvement, and fund reconstruction the way we should), but there is also a disparity between what we should do and are seen as capable of doing (which is what Nixon is speaking to). This is the man on the moon perception problem. The troubles of the United States in Iraq have been blamed on many causes: too few troops, wrong strategies, flawed intelligence, a very stubborn commander-in-chief. The Man on the Moon rarely rates a public mention. But the Man on the Moon looms so large in relations between the U.S. and 28 million Iraqis that every U.S. field commander knows his job would be easier if no American had ever set foot on the moon. “U.S. forces start with a built-in challenge because of their reputation for accomplishment, what some call ‘the man on the moon syndrome.’ This refers to the expressed disbelief that a nation able to put a man on the moon cannot quickly restore basic services. The “expressed disbelief” is voiced in such questions in Iraq as “how come the Americans could send a man on the moon but can’t bring us power. Or water. Or jobs. Or security. So reconstruction efforts have as obstacles not only institutionalized corruption, lack of funding, lack of proper NGO support, and insurgent activity, but perception as well.